I was invited to a “meet and greet” last evening. Regularly, I get invitations to business networking events, BNI meetings (and similar) and small gatherings. Instantly as I think about these events, negative thoughts happen. It all started when I was fresh out of college. I worked for a large ad agency. I ran into a guy I hadn’t seen in a long time. We exchanged some kind words and then he took amazing interest in me. He wanted to know what I was doing now and gushed on and on about the position I had. He made me feel great. Then he said the words that I’ve become skeptical of. “Well, I have a business idea I’d love to share with someone like you. Can you meet with me?”. Uh-huh. That’s a typical “generic” request as a perfect setup for a multilevel marketing meeting. I didn’t know it at the time. I arrived and wondered why so many were there. And they did too. It was the strangest thing I’ve ever encountered. Networking is essential in order to operate an organization. We rely on people telling their friends about something that they love. If someone tells someone, and then they tell someone, the multiplication factor is amazing for reaching large groups. We just need to avoid the awkward MLM type meetings! Enter: Social Networking. Mid 2000’s a great concept occurred to people who knew how to program websites. Let’s do this online! Groups of people. Easy to join, easy to segment groups. Social networking sites are known for LARGE collections of people who are like minded (by interests, geography, or just that they have met). Facebook (the big guys) have 750 Million Users. User Generated Content. This is the fun thing! These groups talk and try to interest the others. The content (video, photos, text) they produce adds interest to the others and attracts others. Rarely do the “owners” of the site add content. Facebook has 100 Billion uploaded images. Ability to Share. If you like something on these sites, you can easily share the nugget with your friends. Usually on a “wall”; a continuous stream of the content your friends have posted. Gone are the awkward meet and greets — instead you’re guaranteed to have something in common. Just make sure that when you meet someone on a social network, to genuinely be interested in them. Stop selling, and instead share what you do. If they want what you have, they’ll buy. 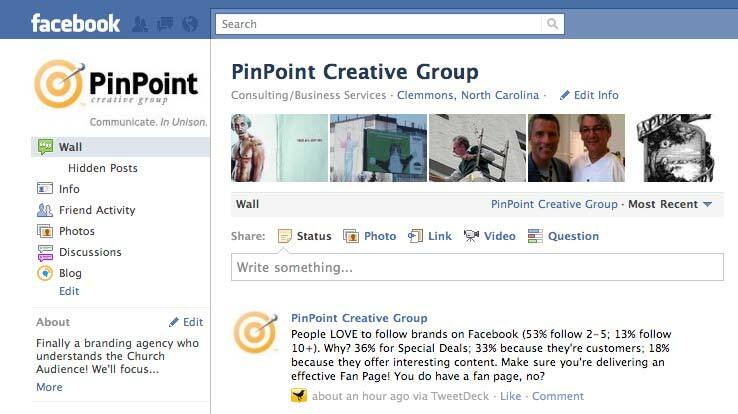 And on Fan Pages, your company should follow the 80/20 rule. 80% entertainment/engagement vs 20% marketing. Good rules for face-to-face meetings too! PS. Be sure to follow us on our fanpage for interesting tips and tricks for Ministries! Click here and like our page! Or our twitter page.